I’m working on a new project called Forgotten Highways. The idea is a series of documentaries about “the old roads” of America. You know- those bumpy strips of concrete you see veering off your current route. Call them scenic roads, the business route, historic bypass, whatever. Every interstate owes its double-yellow stripes to a winding two-lane nearby that most people have forgotten. They’re everywhere and all it takes to find one is a tank of gas and a Sunday afternoon. But it takes more than that to really discover these gems. You have to get off the Superslab® and meet people. In my opinion exploring the history of an old road can make for great video. Of course, maybe I’m biased. Several months ago Brad and I decided to start documenting our motorbike journeys more thoroughly. Whenever we set off on a ride we made sure to include a digital camera and/or the video camcorder. The initial intent was to spruce up the rides listed on Places2ride.com with photos and video clips. After editing a few of the videos (samples are available on You Tube at www.youtube.com/places2ride) we began wondering what would happen if we added in more history, some interviews and maybe a tech tip or two along the way. It all sounded like a TV show we might actually watch! 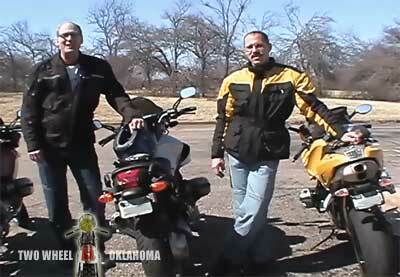 This is when the idea for Two Wheel Oklahoma was born. Right now we’re working on a pilot episode for a half-hour television program about motorcycling in and around Oklahoma. The premise is to cover a particular area or road by visiting points of interest along the route. This first show focuses on Oklahoma State Highway 20. We’re also in the process of writing three more that include the Talimena Drive and Route 66. Once this first one is completed we’re going to work on selling the idea to someone who can get it on the air. In the meantime we’re also looking for more content from other riders who shoot video of their rides in and around Oklahoma, or clubs that have an upcoming event. Drop by and sign up for our email updates while you’re there!